Bye bye bus! Thanks for the awesome ride! Outside Shibuya station near the crossing is HACHIKO!!! It was still quiet and peaceful that time. It's best to go here early mga 7am. Hehe. We wanted to leave our things first and shower before we explore the city. So first thing we did was to find our accommodation. If you base it on the map available sa Airbnb app, it's kinda confusing. We tried to ask for directions but we still got a little lost. So we decided to take a cab to save time. It turned out to be super near the crossing! Saw these crazies on the road! I love it! You could actually rent a go kart, dress as a character from Mario Bros and drive around Shibuya. Haha. If you see this Don Quixote store at the corner, turn left! Turn left before Lawson and go up the street. You'd see this resto on the left. Akin ata to eh haha. You'd see this Spiral bar & resto on your right. I was told they serve delicious oysters! And then you'd see this building on your left! This is it!!! I love how they have a vending machine just outside the building. Hehe. Followed our host's detailed instructions on how to retrieve the room key and code for the main door. It was just perfect for the 3 of us! The main bed is an airbed which I don't like, so I just slept on the floor. View from the door. May elevated area. Pocket wifi! But it was super slow. It's still better to bring your own or just connect sa public wi-fi. Haggarda! Before taking a bath haha. My sleeping area. And Sarah's hehe. Ayaw namin ng airbed kakahilo haha. After we've settled in and showered, it was time to head out and explore some more! We dropped by Modi mall (which was also near our place) so Ana and Sarah could book Robot Show tickets. There's a tourist information van outside the station with this kind old man manning it. Love him! Saw this resto inside the station and decided to eat there! Mejo fail coz no english menu. Mali naorder ko. Haha. Wanted this sana. Cold soba meal with tempura for 620yen or P300. They served me this instead. Angyare haha. Train to Ginza is here! Rode the Tokyo Metro Ginza line. It's 7 stops away from Shibuya. So big this Uniqlo store!!! They close the street during weekends! Swerte! Went cray cray shopping at GU! Just bring your passport para tax free! Thanks to our loves Kiko Cagayat for this shot! Ganda! Has anyone tried this? Is it good? The line's super long. This resto too. Box office the line! Love this store! Bet ko the plaid wall. So cute! And so yummy. I was super hungry so I ordered the beef stew set. It's quite pricey for 1,000yen or amost P500. But super gutom nako so kebs na haha. Had so much fun bonding with these amazing people! One of our favorite stores in Tokyo is WEGO. Lakas maka 80s the peg ng store with neon lights, neon signs and tigers. At first glance I thought the sign says Condominium. Iba pala. Haha! We decided to explore naman the famous Takeshita Street! Kaila had to go home na. Thanks for your time girly!!! You all should check out here famous online store http://japanloverme-store.com/. You could buy authentic Japanese Sukajan jackets there! Thank you Kiko again for this shot even if pinigilan natin dumaan mga tao. Haha! My #1 favorite store in Tokyo is MONKI!!! Grabe super love the designs and the quality of the clothes. Bought quite a few sale items! Dito daw nagshoot ng music video si Avril Lavigne. Was not able to find cheap souvenir shirts:( Cute pa naman nito! 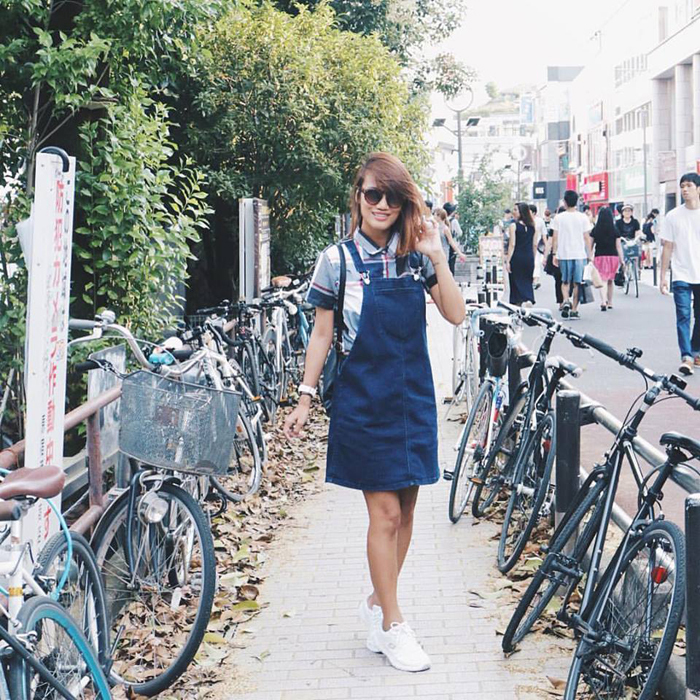 Don't miss this area when you're in Harajuku! Ana bought a tub. So good! Kiko had to go home but he was nice enough to drop us off near our place. Huhu. Love you! You could actually walk from Harajuku to Shibuya! Kiko showed us the way. Hihi. This place looks familiar! Hihi. We passed by this tunnel and saw that we were near Shibuya na! Cool. How cute is Astro Boy? Hehe. Reminds me of the film Empire Records! Shibuya crossing at night! Surreal! Curated vintage store! In short, ukay ukay na sosyal. Haha. It was already 9pm and we haven't eaten dinner. We came across this slightly hidden resto and decided to check it out. Sarah has been craving for Okonomiyaki ever since Osaka, and it was the resto's specialty so mejo perfect. There were a few people waiting outside but they were immediately seated. Yey! Our bowl of goodness! I ordered seafood. Sarah taught me how to cook my okonomiyaki! It was quite fun! Shaped it into a heart and added toppings! Nomnomnom. Shops were already closed ng 9-10pm. I wish they have longer store hours. We got home at around 11pm and slept early (weh early ba talaga hehe) in preparation for our tour the next day. Tokyo Day 2 and 3 coming up next! :) Thanks for reading!